I love to try new desserts. Sometimes we are invited over to a friend’s house and I have to come up with something quick and hopefully good to make. I love to bake desserts for other people. They seem to think that it must have taken hours to cook just because it was baked! Even for the most simplest dessert. 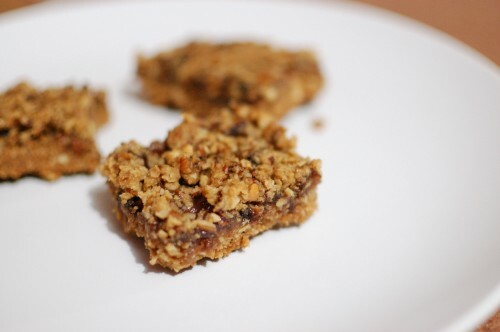 This recipe for Oatmeal Raisin Bars is no exception. All the ingredients are always stocked in my pantry and cooking/baking them up was a snap. But because they turn out so delicious, friends cannot believe that they are so simple to make. They are super addicting too so be careful! Delicious Rating: This is the perfect easy recipe for when you don’t have time to go to the store but need a dessert asap. Most everything is kept in the pantry anyways so there is no need to buy anything. These bars are delicious and super easy to cook. I didn’t know how the peach would taste but it was a wonderful addition. Feel free to switch it up with perhaps apricot. Use vegan margarine to make this dessert recipe completely vegan friendly. Serve once set for dessert or breakfast. Lightly grease a 9×13 baking pan. Add oats, flour, sugar, baking powder, cinnamon, and salt into blender and blend until all is combined. Pour into a bowl and add in butter and peanut butter. Add 3 cups of the mixture to baking dish and press it down evenly with hands. With a fork, stir peach preserves in a bowl until smooth. Spread over cookie base, leaving 1/4 inch edge. Add raisins and pecans to remaining crumb mixture and sprinkle over preserves, pressing down gently. Cool for 15 minutes or more until firm and able to hold its shape.